For collectors, there is an irresistible appeal to be found in watches that were produced by multiple manufacturers. It happens when government contracts are issued: it is incumbent upon buyers to ensure that equanimity has been shown. Normally, contracts go to those proffering the lowest bids, but in wartime, several sources are needed to guarantee supplies. Most buffs know of the 12 makers that responded to the British Ministry of Defence to create the W.W.W. watches, a.k.a. 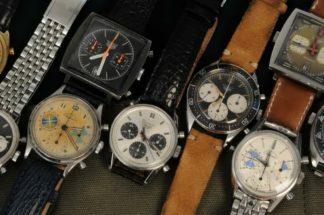 the “Dirty Dozen.” For the French Air Force, at least seven houses produced Type 20/21 chronographs, while three or more brands supplied CP1s/CP2s for the Italian military watches brokered by A. Cairelli. As for Germany, one collector site has identified 68 brands, from Acacia to Zenith, who supplied the Third Reich’s infantry. The watches they created look exactly like the W.W.W.s of the Dirty Dozen, but amassing a complete set of them is as daunting a goal for the acquisitive enthusiast as exists in the field of military timepieces. Better news, then, is that the watch under discussion, the legendary B-Uhr (for Beobachtungs-uhren, or Observation watches) was sourced only from IWC, A. Lange & Sohne, Laco, Stowa and Wempe. Research may one day turn up others, but the consensus is only this quintet produced B-Uhren (plural for B-Uhr). Let’s call them the “Flieger Fünf”, of which the IWC is the most coveted and – because it returned the B-Uhr to production for civilian consumption – certainly the most recognisable. We must not forget one thing, something many watch enthusiasts find inescapably distasteful: B-Uhren were used by the navigators of Nazi bombers who wreaked havoc over Europe. For some, it’s easy to dispense with this thought thanks to the passage of nearly 75 years and the public’s increasing re-writing (or denial) of history, but it must not be ignored. History lesson over, and one’s sense of journalistic equanimity demands recognition of the B-Uhr as among the most distinctive and impressive pilots’ watches of the past 100 years. Its roots date back to 1935, when Hitler stated it was his intention to revive a German air force, or the “Luftwaffe,” in spite of the restrictions placed on Germany by the Versailles Treaty that marked the end of WWI. Orders and specifications came from the Ministry of Aviation, or Reichsluftfahrtministerium (RLM), the government department responsible for developing the Luftwaffe during the Third Reich. RLM’s duties also included communications, anti-aircraft artillery and other related materiel, so timepieces for navigators would also come under their auspices. In particular was a need for accurate timepieces for bomber navigators. A precedent was the Weems design that reached its pinnacle in the modified version devised by Charles Lindbergh with Longines. Hour-angle indication, however, was not deemed necessary. The resultant watch with hours/minutes/seconds was issued in two variants, Type A and Type B. IWC, uniquely, issued only the former, with Arabic numerals for each hour except 12. At this position on the dial, the design demanded the ultimate in legibility, a large, upward-pointing equilateral triangle with a dot on either side of its uppermost point. Type A dials were black with bold, white indices, white elongated sweep seconds hands and sword (also called “dagger”) hour-and-minute hands. By necessity, the hands were lengthy as the watches were 55mm in diameter. To aid setting and winding while wearing gloves – a requirement in freezing cockpits – the B-Uhren featured oversized crowns, in a variety of shapes from straight-sided, serrated cylinders to larger, conical variants. Also offered as pocket watches by Wempe and Lange – logical, as B-Uhren all used pocket watch movements – the Type B’s dial had its hour numerals replaced by the numbers 5-55 in increments of five minutes, with an inner chapter ring marked 1-12; this is the version IWC did not adopt. Here the inner dial was printed, rather than a separate disc as on a Lindbergh, as it was simply there to show hours. Like W.W.W.s, B-Uhrens were specified with Breguet balance springs. As with IWC’s pilots’ watches, the movement was protected by a soft iron core to afford resistance to magnetism. IWC is the only completely Swiss B-Uhr of the five, although German brands Wempe and Stowa used outsourced Swiss movements; Lange and Laco employed their own in-house calibres, making them 100 per cent Teutonic. All featured with hacking seconds for accurate synchronisation of the crew’s watches. Because these were intended to be worn over leather flight jackets, the watches were fitted with wide, riveted leather straps of sufficient length to account for the thickness of the sleeve or even over one’s thigh. As with nearly all military watches, inner and outer snap caseback engravings allow precise identification. All B-Uhren were engraved with “Anforderz FL23883”, with “FL” for “Flieger”; “23” indicated navigation purposes. Other engravings reveal type, production number, movement, order number and manufacturer; unlike W.W.W.s, Type 20s/21s and CP1s/CP2s, the makers’ names do not appear on the dials. As with all military watches, B-Uhren were the property of the issuing branch of the service, but – as collectors know – many escaped destruction after serving their time. It is known that B-Uhren were issued to navigators before their missions, to be returned upon completion. The watches were used to set their time to the standard time of the German Naval Observatory (Deutsche Seewarte) upon receiving a timing signal. 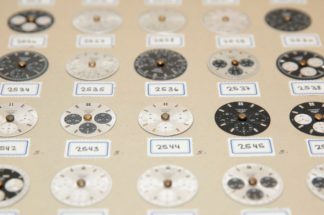 All were tested to Deutsche Seewarte’s chronometer standards. After a half-century of fetching vast sums in auctions – with IWC and Lange models as the most valuable, followed by Wempe in the middle and Stowa and Laco slightly less cherished – B-Uhren facsimiles are now plentiful. 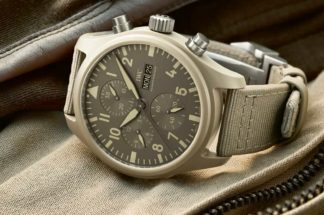 Stowa’s and Laco’s are back in production (both Types A and B) at affordable prices and various sizes, while a number of brands not part of the Flieger Fünf have issued replicas. Among producers of affordable modern B-Uhren are houses as diverse Steinhart, Sinn, Azimuth, Orient, Hager and Citizen. Indeed, there are more manufacturers of B-Uhren today than when the watch was originally supplied. As for Lange’s resisting the temptation to reissue their B-Uhr, it has been suggested in private that the brand found the idea inappropriate. Bravo, says I.
IWC’s hugely successful Big Pilot watch is the direct descendant of the B-Uhr. 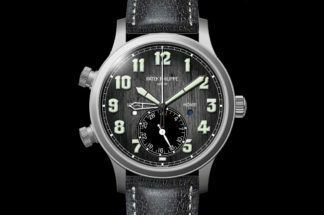 It has sired Top Gun and Ste Exupery versions, chronographs, beautiful “Heritage” models with aged-look lume, a bronze version and many others. The Big Pilot also performs a useful service for those who covet and original, of which one source says only 1000 were made and which far fewer survive. A 1940s IWC B-Uhr? Strictly the preserve of auction houses, with prices ranging from $20,000-$50,000 depending on condition and provenance. Seig heil, I guess. It wasn’t for flamboyant dress sense but life-and-death necessity that Big Pilot watches were originally made large enough to wear on one’s thigh. Times have changed, yet enough things haven’t: descended from the B-Uhr, the IWC Big Pilot remains a handsome, sturdy and generous-sized ticker with long power reserve that is also an ideal canvas for complications. Here then, an assembly of Big Pilots through the years. The first series Big Pilot, in 46mm steel case, with 7 days power reserve from self-winding 2.5Hz cal. 5011. Also released were two versions in platinum: blue dial (500 pieces, IW5002-02) and black dial (500 pieces, IW5002-03), with color-matched straps. In 46mm steel case, with 7 days power reserve from updated cal. 51110 self-winding movement (3Hz). On the dial, the ‘12’ index makes way for the triangle marker, and ‘9’ is removed. Also available in white gold with grey dial. From 2008, a version in platinum with silver dial was sold as a Father and Son set, paired with a Mk XVI. In addition to brown-dial Antoine De Saint Exupery limited editions in platinum (unique piece), white gold (250 pieces), rose gold (500 pieces) and steel (1,149 pieces), numerous boutique editions were also released mainly in rose gold, with exceptions being the Big Pilot Tourneau 2010 with platinum case and panda dial (10 pieces), and Shanghai Boutique in white gold with blue detailing. In the run-up to EURO 2012, there was also a non-limited edition for the German Football Association (DFB) in steel with small seconds. Muhammad Ali Special editions were also introduced in 2012 to celebrate legendary boxer’s 70th birthday, in steel (250 pieces) and white gold (unique piece, with Muhammad Ali’s signature engraved on the caseback). In 46mm steel, 7 days power reserve from self-winding cal. 51111, an improvement of the earlier cal. 51110 with the substitution of hardier beryllium bronze bearings in place of steel ones. From 2016, the IW5009-01 was replaced by the IW5009-12, which sees the return of the ‘12’ index and ‘9’ numeral to the dial. There was also a 250-piece limited edition in steel to honor the aerobatic team of the Swiss Air Force, Patrouille Suisse, featuring subsidiary seconds (IW5009-10). A year following the release of a trio of heritage models under this reference (see below), non-limited versions in 46mm steel case were released, with black dial, and a ‘Le Petit Prince’ version in blue. Driven by self-winding cal. 52110 with updated Pellaton winding, and 7 days of power reserve from twin barrels instead of the single-barrel design of earlier 51000 movements. In 48mm titanium case, with 8 days power reserve from manual-wind cal. 59215, a 4Hz movement with power reserve indicator at the back, and showing subsidiary seconds, also used in the Portugieser Hand-Wound 8 Days. Limited edition of 1,000 pieces. At 55mm, this is the same size as the B-Uhr of 1940, just much lighter as it’s cased in titanium. Driven by manual-wind cal. 98300, a modern iteration of the cal. 98 pocket watch movement from the 1930s. At 2.5Hz, with 46 hours of power reserve. Limited edition of 100 pieces. Combining vintage aesthetics with modern technology, three Heritage models were released under this reference in 46mm case with the twin-barreled cal. 52110: in titanium (non-limited), bronze (1,500 pieces), and ‘Tribute to 5002’ (also called ‘Safari’, 100 pieces) in titanium with dial inspired by the first post-war Big Pilot, the 5002. In 48mm black ceramic case, with titanium crown, stylized seconds hand and liveried caseback, or Top Gun Miramar version with grey Type B dial and cream numerals. Self-winding cal. 51111 with 7 days of power reserve. A 500-piece Boutique edition was released in 2013, in black ceramic with green detailing. Using the same movement as the 5019, a Rodeo Drive boutique edition was released in 2015 (250 pieces) in 46mm black ceramic case with blue dial. The following year, a non-limited version with black dial was released, sans the stylized seconds hand of the 5019. 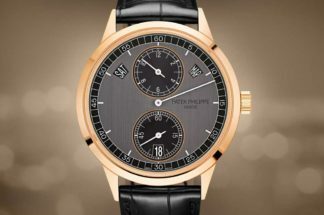 Numerous limited editions and unique pieces were released for charity auction and as boutique exclusives, in 46mm cases of steel, titanium, rose gold, white gold and platinum. Instead of the pair of delta-wing jets framing the moon phase, the brown-dial ‘Antoine De Saint Exupèry’ features a pair of twin-tail P-38 Lightnings. Driven by the self-winding cal. 51564 perpetual calendar movement with double moon phase display and 4-digit year, with 7 days power reserve. An exception was the steel-cased IW5026-41 unique piece ‘Laureus Italia Onlus’ released in 2017 to benefit the Laureus Foundation, which featured the twin-barreled cal. 52610. In 48mm ceramic case, with self-winding cal. 51564 perpetual calendar movement. A 250-piece boutique-only edition with red detailing was released in 2013, followed in 2016 by a non-limited version with embossed calfskin strap. At 46mm, this reference was released in 2013 as a unique piece in platinum for auction in aid of the Antoine de Saint-Exupéry Youth Foundation, and 270 pieces in rose gold to commemorate the 70th anniversary of novella ‘Le Petit Prince’ by Antoine de Saint-Exupéry. Self-winding cal. 51564 displaying single moon phases. A grey-dial limited edition in steel (38 pieces) was created for IWC’s London boutique in 2015. In 46mm case with the twin-barreled cal. 52610, released as the 750-piece brown-dial ‘Edition Antoine de Saint Exupery’ in steel, and the 36-piece grey-dial ‘A Tribute to the 1st IWC Pilot’s Watch’ edition in rose gold. Two limited editions in steel were created to celebrate IWC’s 150th anniversary: blue dial (100 pieces) and white dial (1,000 pieces). Driven by the manual-wind cal. 59235 with grand date complication and 8 days of power reserve, indicated on the reverse.